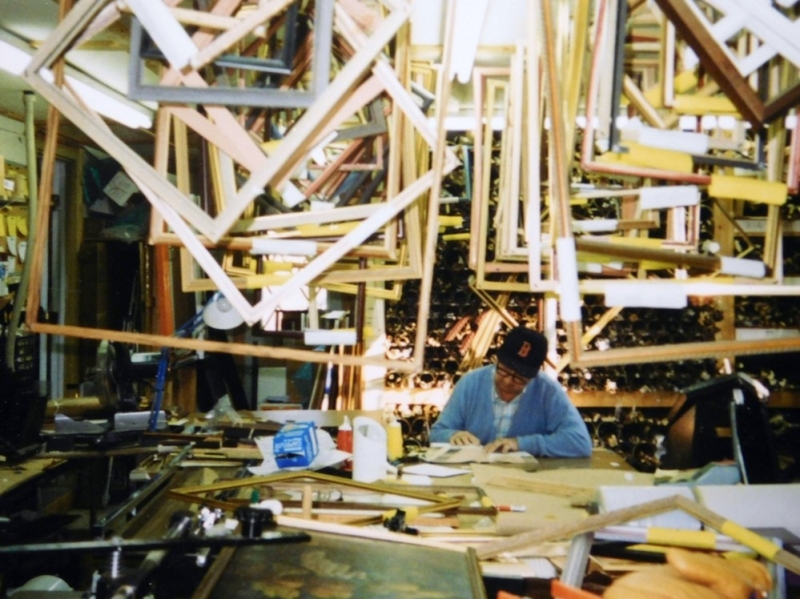 James Wood — Bruce’s father — launched The Woodshed Gallery, a picture framing business, out of the four-car garage on his property in Franklin, Mass., in 1968. FRANKLIN, MASS. – When Angelina and James Wood opened The Woodshed Gallery five decades ago, they could not have foreseen the many changes in American life that would ultimately transform their little picture framing studio and makeshift art gallery in a four-car garage into the internet-based fine art business it is today. The year was 1968 – a year that saw plenty of seismic shifts across the United States and the world, but one thing that did not change much at all though was technology. It was still in the analog age. 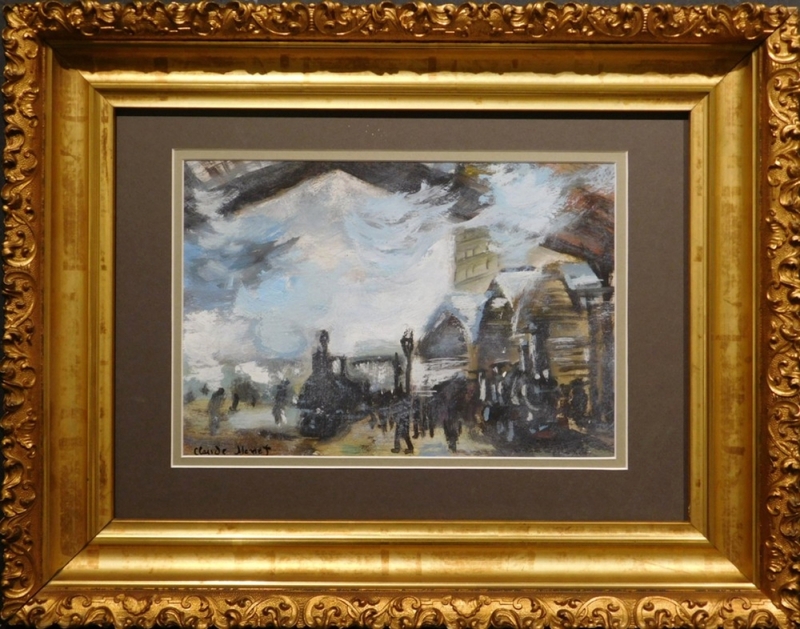 James tended to the picture-framing side of the business, while Angelina used space to paint watercolors – mostly local scenes. 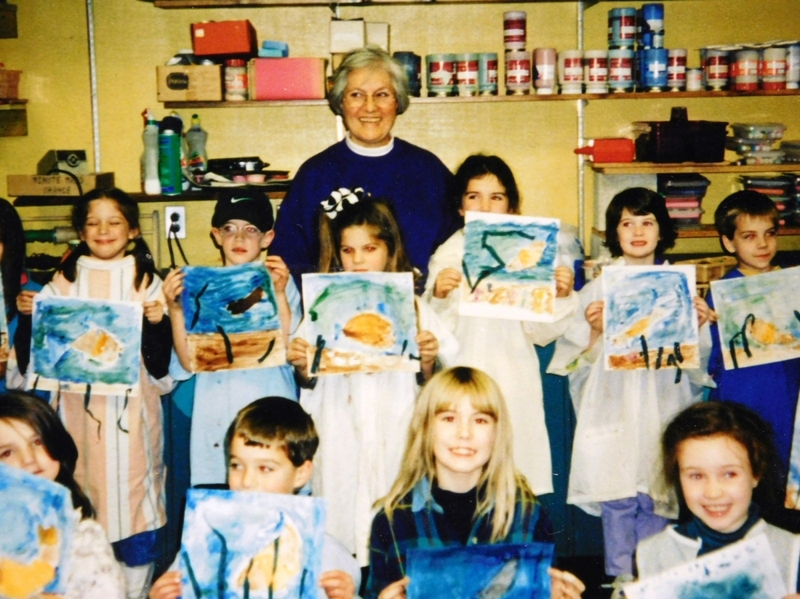 She held classes there, too, teaching the fine art of watercolor painting. Their two daughters, Mary-Ann and Lois, were involved in the business for decades, starting in high school. Son Bruce pitched in as well. And that is how it was for The Woodshed Gallery in the years leading up to the new millennium. Then, in the early 2000s, the big box stores (think Hobby Lobby and Michael’s) popped up, siphoning off picture framing revenues. The family soldiered on, with the parents and two daughters keeping the business afloat. Bruce’s interests were more in fine art than in picture framing, and he earned a BFA from Massachusetts College of Art and an MFA from the School of the Art Institute of Chicago. He became an artist, art conservator and experimental filmmaker. His successes spanned the decades, beginning with solo exhibitions in the 1970s at the Institute of Contemporary Arts in London and the Museum of Modern Art (Beaubourg) in Paris. More recently, his early work received retrospective exhibitions in Chicago and Madrid and has been included in programs of Midcentury abstract experimental films in New York and London. He opened art galleries in Chicago and Michigan, buying and selling fine art and cementing his reputation as an expert conservator of oil paintings. Meanwhile, the early 2000s saw changes for The Woodshed Gallery. Angelina died in 2003 and James’s health began to decline. Lois moved to Florida around 2004 to start her own picture framing business. Bruce Wood calls an auction from the podium during a live video/audio webcast. No bidders are in the room — they are online all over the world. Bruce lent his time and expertise to help with the family business as best as he could, but he had two galleries and a conservation business to run halfway across the country. Then the financial crisis of 2008-09 hit, and it was so devastating Bruce had to close both galleries. His conservation work sustained him during those tough times, then his father passed away in 2013. Bruce relocated his art restoration business from Chicago to Franklin, then purchased the property from his parents’ estate and became the sole owner of The Woodshed Gallery. Mary-Ann left to pursue her passion, costume jewelry design. Bruce began to make plans for his first public auction, in the very birthplace of The Woodshed Gallery, but another conversation derailed that plan and launched Bruce Wood into the digital age. The conversation was with Dylan Ferrara, an auctioneer who is licensed to give classes. 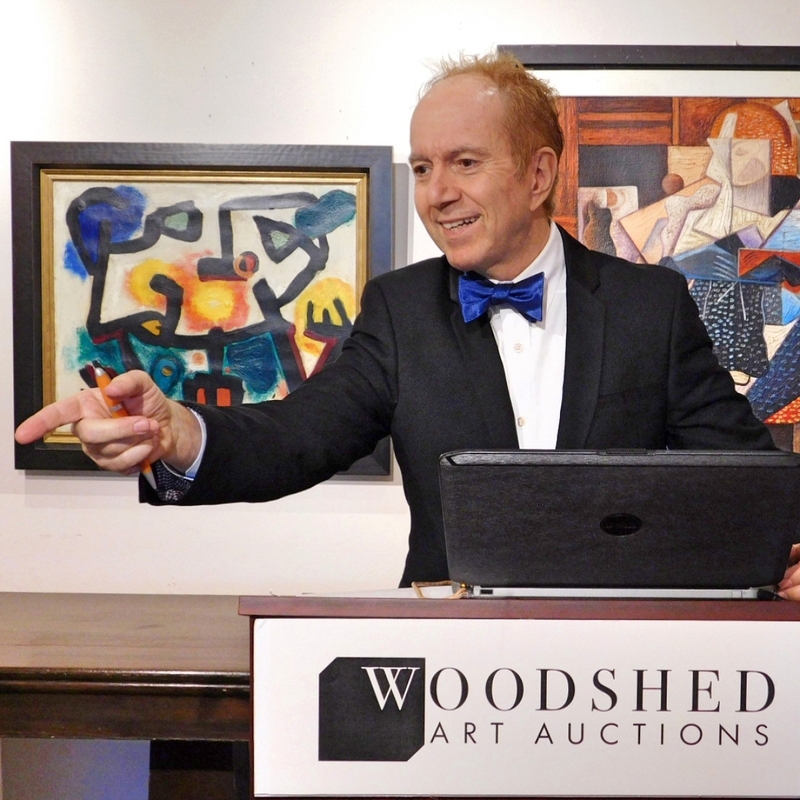 Wood took that advice and a new business was created: Woodshed Art Auctions. In just over three years, the firm has carved a niche in the crowded and competitive fine art auction marketplace. 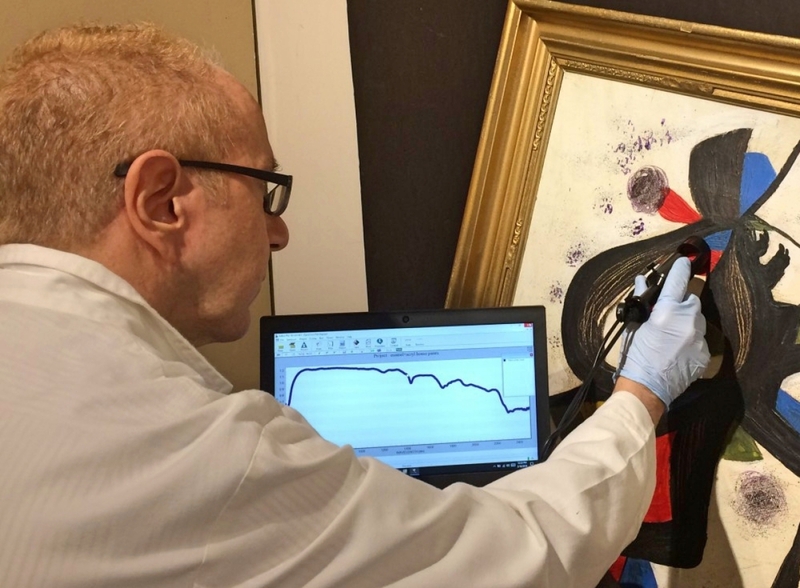 The heavy hitter in Bruce Wood’s modern-day, high-tech arsenal is a near infrared spectrometer, which is used to identify the components of paints, inks, canvas and paper. The most sophisticated technique is the near infrared spectrometer, used to identify the components of paints, inks, canvas and paper. “The spectrometer is a very specialized tool that has already identified some works as nonauthentic, and others as possibly the real deal,” Wood said. Other tech tools include ultraviolet spectrum lighting and UV camera, which shows retouching, restoration and old and new varnishes; and infrared lighting and IR camera, which show some of what may be under the paint, not visible to the naked eye (in some instances it has revealed underdrawings, changes to the composition and entire paintings hidden beneath the surface). Also put to good use are a surgeon’s binocular microscope, which aids in examining paint and varnish layers; and a variety of conservation tools and chemicals that are sometimes used to determine the age of paints. “Oh, and our brains come in handy, too, from time to time,” Wood said, giving a nod to good old-fashioned eyeballing, gut feeling and a little Yankee intuition. Wood has a dedicated staff of two. The first is his partner, William Janosco, an artist and art historian, with a background in Nineteenth and Twentieth Century American art and two degrees in fine art. Janosco was director of the library at the Terra Museum of American Art in Chicago, and for years he was a photo researcher at the Ryerson Library of the Art Institute of Chicago. 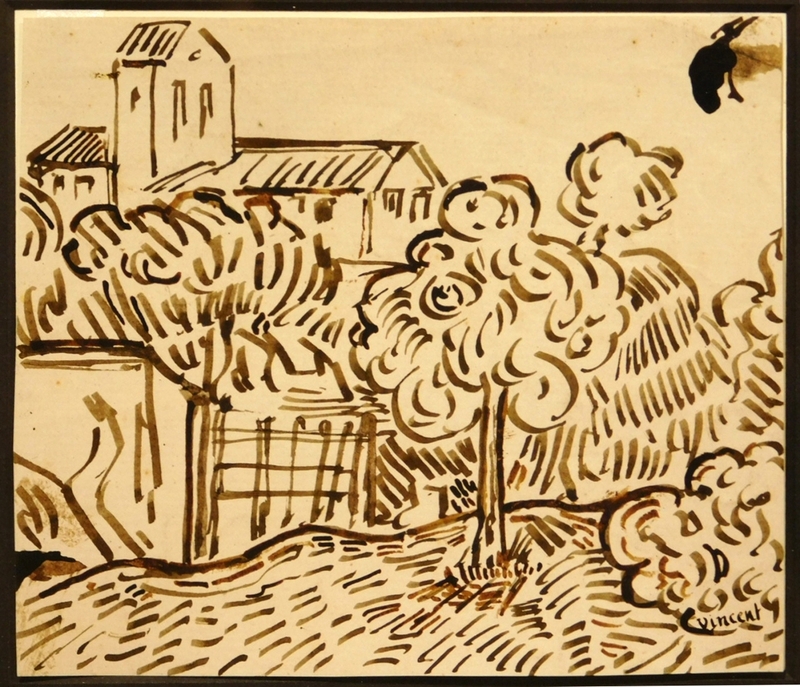 Wood, as a conservator of oil paintings, is a member of the International Institute for Conservation of Historic and Artistic Works in London. Mary Jameson, an art appraiser certified through the Rhode Island School of Design and the American Society of Appraisers, is also an accomplished visual artist and the co-owner of Saltwater Studio, an art and design studio in Newport, R.I.
Woodshed Art Auctions now holds numerous online-only auctions. The biggest problem before was not attracting consignments, it was spreading the word to potential bidders. Now, that dilemma has flipped. Bruce has plenty of buyers; he needs a stronger and steadier stream of artworks. There is little doubt that will happen. Success does beget success. Angelina and James would be proud. Woodshed Art Auctions is a family-owned art gallery specializing in oil painting restoration and live and online art auctions, celebrating its 50th anniversary. For further information,www.woodshedartauctions.com or contact Bruce Wood, 508-533-6277 or bruce@woodshedartauctions.com. 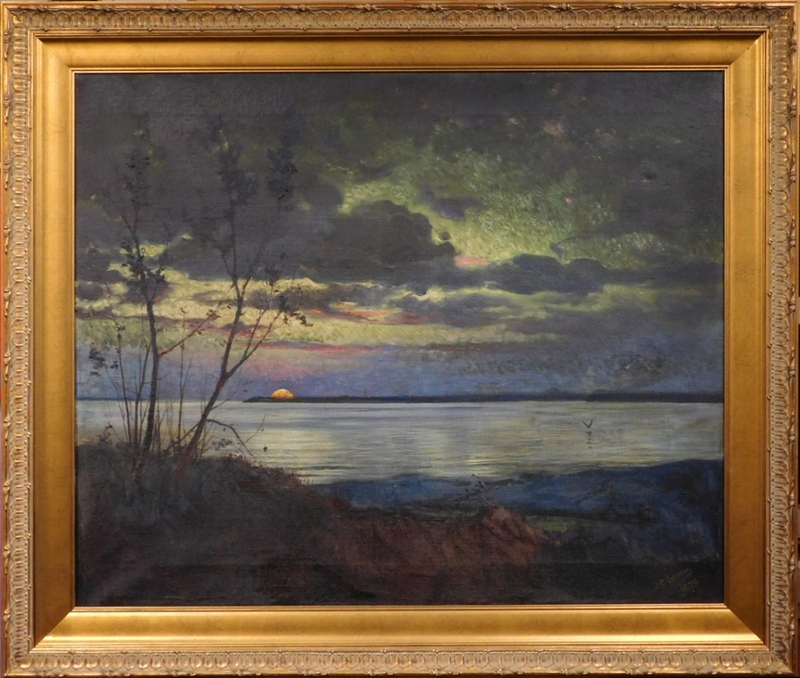 This 1878 oil on canvas painting attributed to Jasper Francis Cropsey (American, 1823–1900), titled “Autumn Sunset,” signed “JF Cropsey,” made $38,400 in a Woodshed auction held December 28, 2017.